Littelfuse MP8000 Bluetooth® Enabled Relay is an advanced motor protection electronic overload relay that is fully programmable using the Littelfuse app on an iPhone® or Android™ smartphone or tablet. Littelfuse MP8000 relay protects any motor drawing 0.5A to 1000A full load and is designed for single or three-phase systems with 90VAC to 690VAC operating voltages. This overload relay combines in a single package protection for overload, voltage, phase loss and reversal, voltage and current unbalance, power monitoring, and underload. Users can utilize the Bluetooth interface for standalone applications when paired with a smartphone or tablet. These units also feature an Ethernet communications port that can be used to form an Ethernet Modbus TCP/IP network. 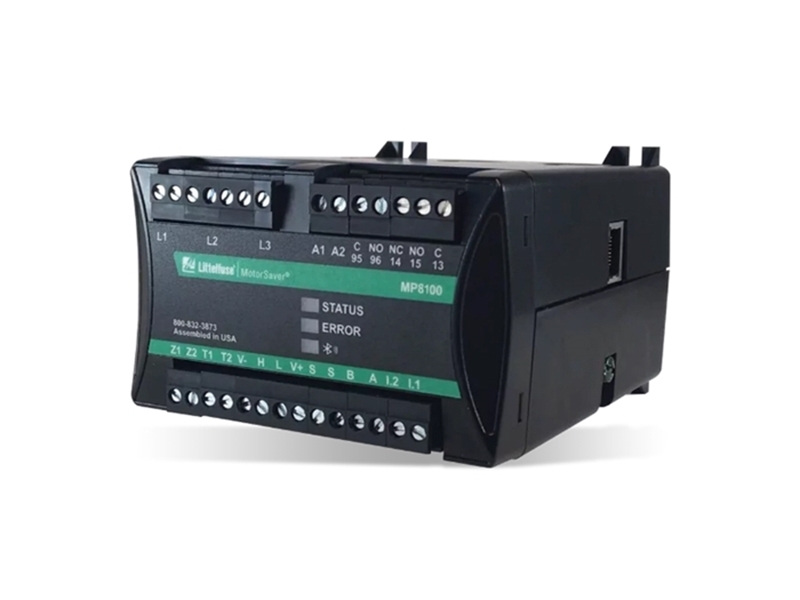 These relays can be remotely monitored and controlled from a PC or SCADA system. Data logging is available through a PC with the optional Solutions software or other software program using the MP8000 memory map. This monitoring and control enhances arc-flash safety. Applications include conveyor systems, HVAC equipment, saws and grinders, fan motors, and almost any pumping application. You can check out our relay products here.